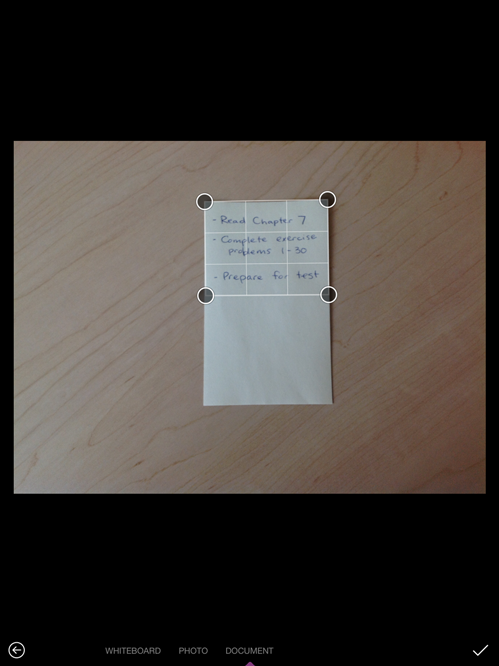 Office Lens is the new camera built into OneNote for iPad or iPhone that lets you take pictures of whiteboards or printed documents, then enhances your photo by cropping, sharpening, and straightening it, so it looks almost like a scanned image. Your picture is added to your note so you can retrieve it later. Create a note or open an existing one, then tap on the note in which you want to insert an image. On your iPad, tap Insert, and then tap Camera. On your iPhone, tap the Camera icon on the ribbon above the keyboard. Choose a picture taking mode: WHITEBOARD, PHOTO, and DOCUMENT, and take your picture. Office Lens will automatically crop your picture, but you can change the cropped image by clicking and dragging the circles to change the crop. When you’re finished tap and Office Lens will add the photo to your note. Tip: If you want to switch back to the built-in iOS Camera app, go to Settings > OneNote > Camera Setting, and turn off Use Office Lens.